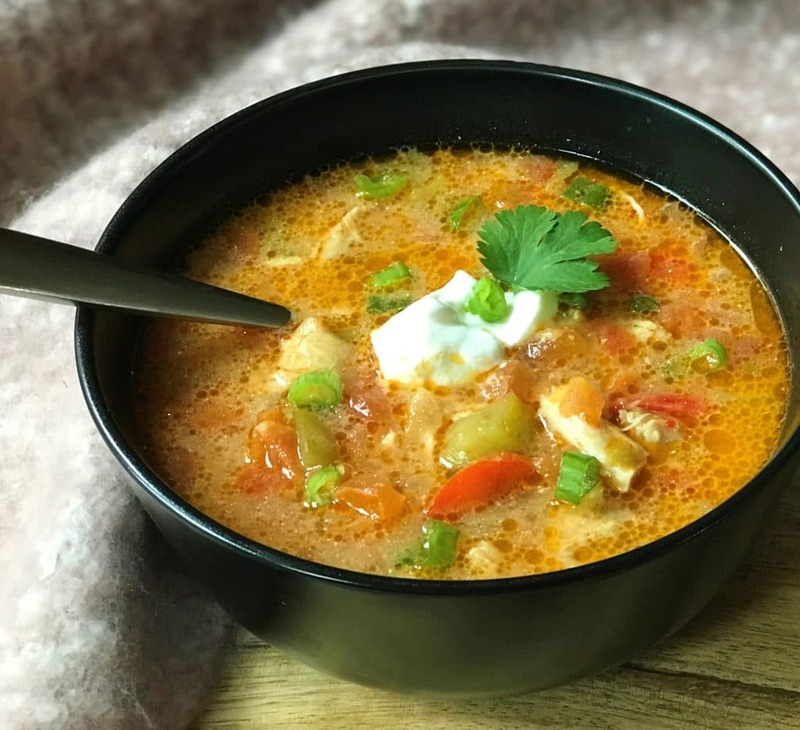 Chicken Fajita Soup made in the Instant Pot or Pressure Cooker. 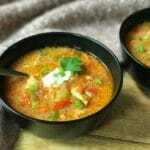 A delicious and healthy soup with tender chicken, lots of veggies and spices. A perfect meal for the cold weather! 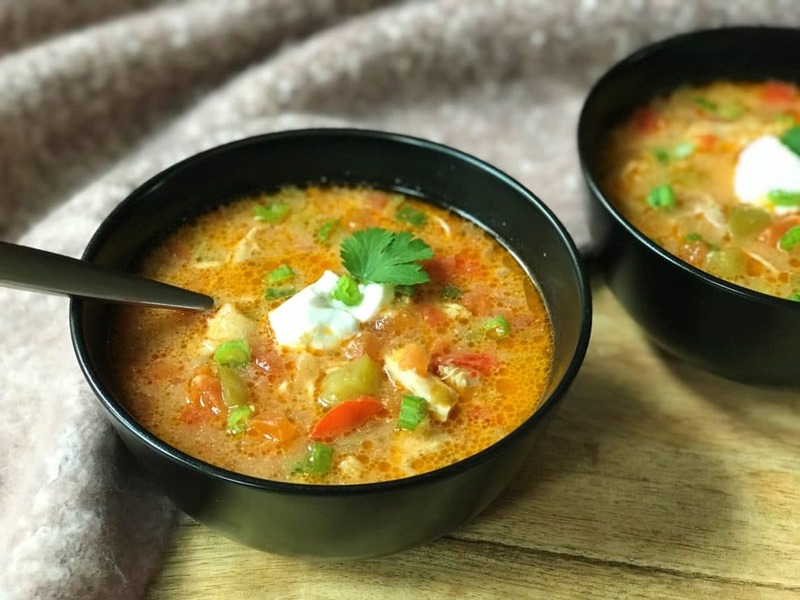 This Instant Pot Chicken Fajita soup is gluten free and low carb. If you like fajitas, you will love this soup. This soup is loaded with bell peppers, onions, jalapeño, diced tomatoes, lemon and spices. It tastes great the next day and freezes well too. Want to do meal prep? 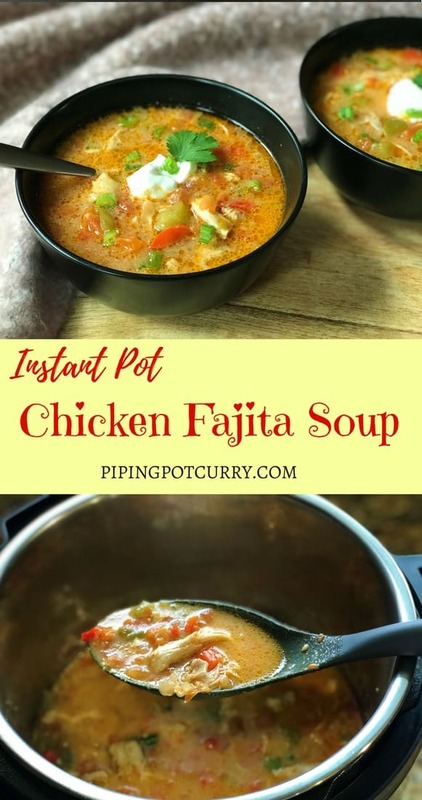 How to make Chicken Fajita Soup in Instant Pot? For this soup, start with sauteing the onions, garlic, jalapeño and bell peppers. You can actually skip the saute step, however I feel it is a good kickstart and heats the pot and ingredients, which also helps to get the pot to pressure sooner. Then add the tomatoes, layer the chicken thighs and set to pressure cook. I prefer chicken thighs as they are much more juicier (yes, fattier as well). But chicken breasts work just as well in this recipe. If you are using smaller pieces of chicken, reduce the cooking time to 8 minutes. The only main work in this recipe is chopping and shredding. So the next step is shredding the chicken after it is cooked. It took me hardly 3 minutes to shred the chicken. Then add it back to the soup. Add the garnishes, and soup is ready to be served! I kept this soup low carb and did not add any beans in it. But if you like, a can of black or white beans could be a great addition to the soup. Add then along with the tomatoes. Enjoy the soup topped with some scallions. Other great toppings could be shredded cheese, sour cream, avocado or tortilla strips. 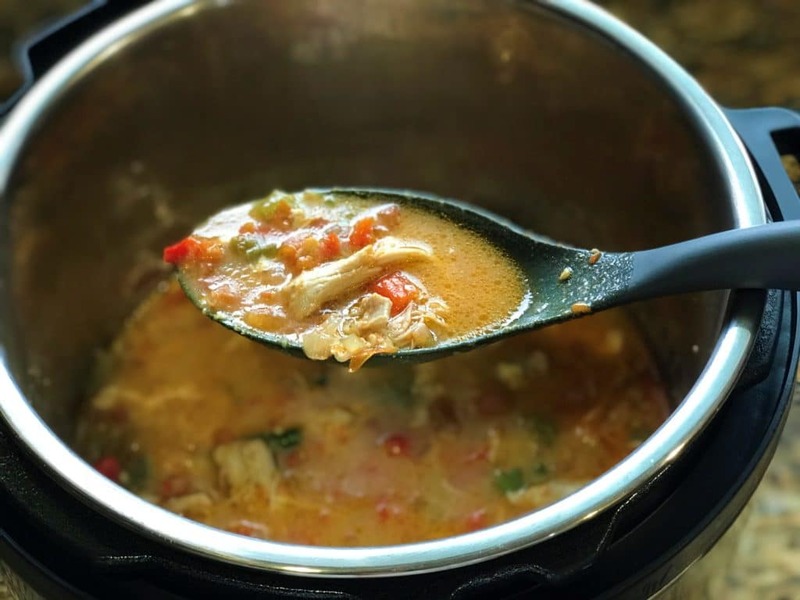 A delicious and healthy Chicken Fajita Soup made in the Pressure Cooker. Flavor packed with tender chicken, lots of veggies and spices. Low carb and gluten free. Start the pressure cooker in SAUTE mode and heat it. Add oil, onions, garlic, jalapenos and bell peppers. Stir and saute for 2 minutes. Add tomatoes, broth and spices. Stir it all up. Scrape anything stuck to the bottom of the pot. Place chicken pieces in a single layer and gently press them under the liquid. Press Cancel and close lid with vent in sealing position. Set on Pressure Cook mode at high pressure for 12 mins. Do a 10 minute NPR, which means open the instant pot 10 mins after it beeps. Remove chicken pieces and shred them. Put the shredded chicken back in pot. Add the lemon juice and sour cream. Stir continuously as soon as you add the sour cream, so it does not curdle. (Optional) Add your favorite toppings - tortilla chips, avocado, cilantro, shredded cheese, sour cream or guacamole. I have used Better Than Bullion base to make broth. It is just easier to keep at hand for all my cooking. You may want to skip adding salt if using this. If you have taco or fajita seasoning at hand, you can add 1 tbsp in place of cumin, coriander and chili flakes. If you are using smaller pieces of chicken, reduce the cooking time to 8 minutes. Hi there, this sounds delicious. How can I made it in a regular pot on the stove- or in the crockpot? I don’t have a pressure cooker. Thanks! Hey Lee – You should be able to do the same steps in a pot on the stovetop. Lower the heat after adding the chicken. Cover with a lid while the contents are cooking. Stir in between at 3-5 minute intervals. It will just take longer, about 20 minutes for the chicken to cook. Then shred the chicken and add it back to the pot of soup. Hope you enjoy it! I love your recipes, and the narrative that you provide with some of them. My mom used to make soup or daal with fish head. If possible, could you please a recipe using fish head for making soup or daal or any other dish at your convenience. This was delicious! I used chicken breasts instead of thighs (personal preference) and before I added the chicken back in after I shredded it, I used an immersion blender to blend the veggies up some and to thicken the soup base. It was SOOO good. I will be making this again! Hey Jeanette – Sorry I missed your comment before. Glad you enjoyed the soup. Thank you for sharing back your review!